I minored in chemistry back in college - many years ago (and before a lot of sleep deprivation, hahaha) - but I knew the answer would be in the reaction between glue and liquid starch or borax. After doing a bit of research, I discovered that anything containing a borate ion would react with the polyvinyl alcohol in washable school glue. A little more research, and I'd found out that borax and boric acid both produce the borate ion when added to water. So I needed to see if there was a source of borate ion (either borax or boric acid) that was readily available in the UK. I knew that borax is traditionally used in laundry detergents, so I started there. It isn't as easy as one would hope, however, to find the ingredients in laundry detergents. Because they aren't food, the manufacturers aren't required to disclose the ingredients on the labels. So I looked up the MSDS sheets (these are available on brand websites) for several brands of laundry detergent that were widely available. I also only looked at brands that were classified as non-toxic. UPDATE 11/19/15 - Though this has worked for over a year, I'm suddenly getting several reports that the 7th Generation is no longer working. The website hasn't updated the ingredient list since May of this year, at which point the ingredients were still the same. Update 11/22/15 - I was able to find a bottle of the new 7th Generation Free and Clear and the bottle no longer lists boric acid - the needed ingredient. :( Older versions of 7th Generation should still work, but the new formula won't work. Eventually I hit gold with a few different brands, but most of the laundry detergents were scented and/or strongly colored, making them poor candidates for slime-making (pheeeew the smell was pretty overpowering with some of them). At last I found the perfect laundry detergent (links for several International listings are at the bottom of the post). Now mind you, you need to use this EXACT laundry detergent to make slime (not a different type of Tide). Please keep in mind that not any laundry detergent will work, and not even every type of laundry detergent from this very brand will work. Please also keep in mind that if you or your child regularly react to laundry detergents and have very sensitive skin, that creating a laundry detergent slime may irritate your skin. To make your slime, you will need a PVA-based glue. In the US and Canada this is a washable school glue like Elmer's. If you live outside the US, please read the safety warnings on the glue you choose. There are several PVA-based glues that are commercial grade and are not meant to be handled. I recommend selecting a non-toxic school glue for children. You can use either clear or white glue. We like using clear. Add two bottles of glue (about 10 oz total, but this is very flexible) to a container and slowly add Liquid Tide Free and Gentle about a Tablespoon at a time, stirring each time. Depending on the concentration (2x, 4x, and 8x concentration), you'll need to add anywhere from a few tablespoons to 1/4 cup or possibly slightly more. Once your slime is no longer sticking to the sides of the container and is holding together in a big clump, you're done! To see photos of what the process looks like, you can check out our How to Fix Slime That Didn't Work Out post - the process looks the same when you use the laundry detergent. If your slime is at all sticky, add a teeny bit more laundry detergent and knead it in. 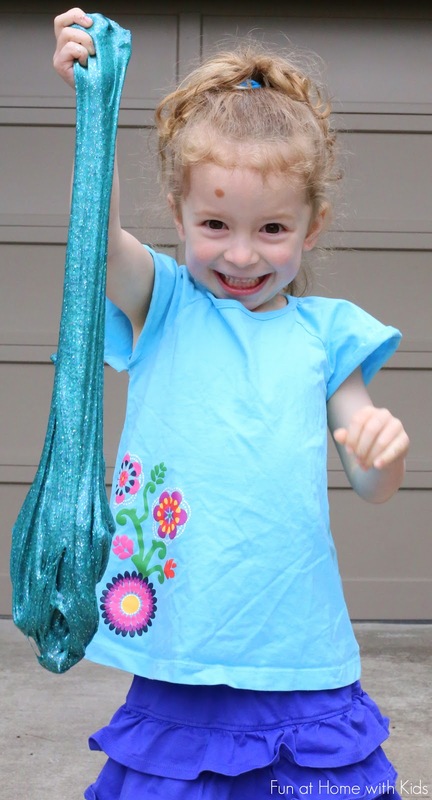 Though the ingredients are non-toxic, I only recommend this slime recipe for kids who aren't going to try tasting it. We have edible slime recipes here if your child is still likely to taste. In light of the possible change in Almat ingredients, Sharon Pereira tried both Formil Bio and Non-Bio. She reports that both work, but the Formil Non-Bio is a bit stickier. 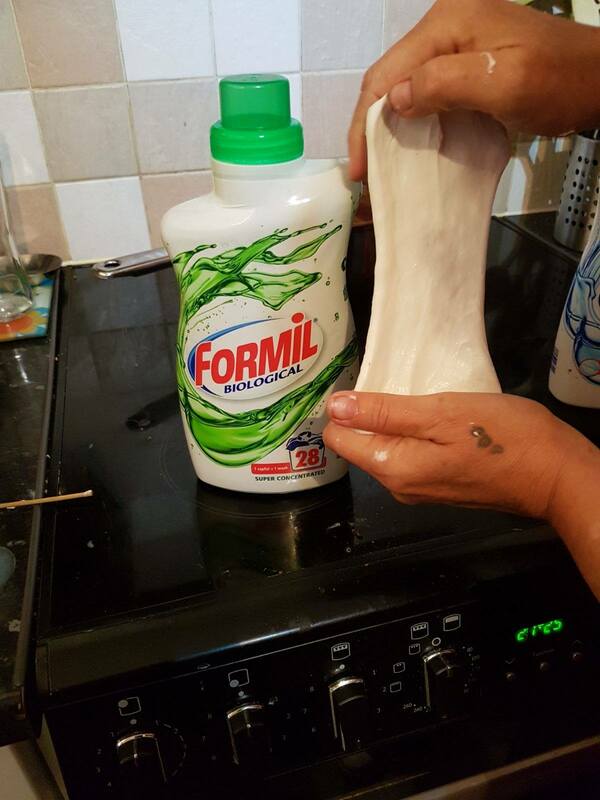 So she recommends just using Formil Biological (photo courtesy of Sharon Pereira). Follow the same directions as listed above to make your slime. Thank you to lovely Lucy for doing the legwork to find a CLEAR PVA glue for UK folks. She confirms that this brand works with Aldi to make clear slime!! So rad - thank you, Lucy!!! And Aussies, Irresistible Ideas for Play Based Learning found an Aussie brand of liquid starch that works in this post. According to my online research, Ultra Ariel Liquid Detergent has the correct ingredient. According to my online research, Liquid Universal Dixan, Blue Dixan Power Gel, and Multicolored Liquid Dixan all contain the correct ingredient. I now have photo confirmation from a reader that Multicolored Liquid Dixan works to make slime! Hooray! Shoot, Swiftlymorgan - the less expensive listings must have been bought up already. :( Hopefully Amazon will restock soon. I am also working on a second alternative method, but the products are shipping to me from overseas so I won't have them for another 2 weeks. Swiftlymorgan - a lovely reader helped me track down a UK brand with the correct ingredient and since it's a local brand it's WAY cheaper. I've updated the post with new links! Yes! It's much easier to research from the country itself as you know which brands are common. 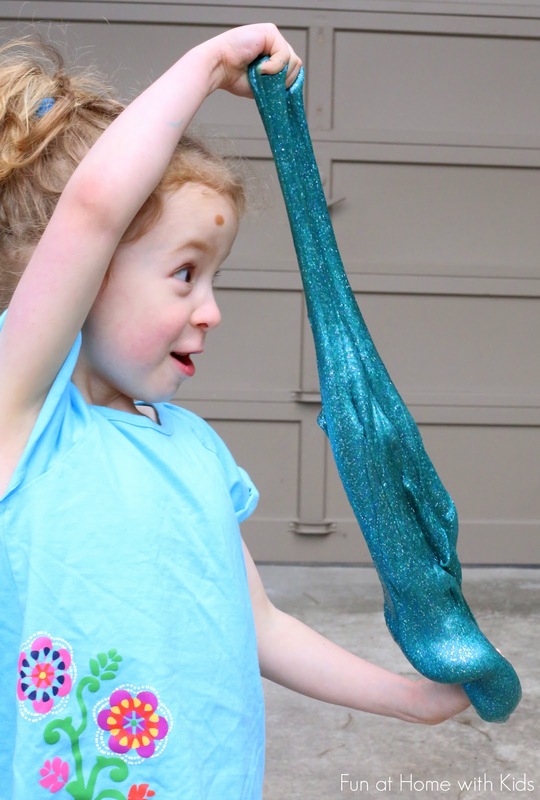 There's also a liquid starch in Australia that apparently works - I'm adding that link to the post right now - it's from Irresistible Ideas for Play Based Learning. WOW! You're Amazing! Ha, but I'm from Singapore. mmm... would you be able to help? If you have the time. otherwise, I shall just drool over the slimy effects...haha... Really wonderful work here! Any news for Singapore :) ? Thanks ! I haven't been able to find any in Singapore. There may be some that work, but most of the brands I've looked into don't list ingredients anywhere for me to look over. So I can't tell for sure one way or the other. So sorry! I wish I could be of more help!!! Thank you for trying ! This is absolutely brilliant! Thank you so much for going to all that trouble so that us UK people can at last make our own version! Will be giving this a try over the Summer holidays! Are you using Almat Non Bio? I am not sure without seeing it myself, but I suspect you need to add some glue until you get the lumps to stick together. Are the lumps of glue rubbery? Or liquid? If you can send a photo, it will help! 1.I see Amazon do have Dylon liquid starch would that do? I can't find the full ingredients on my end for the Dylon Liquid Starch. I would definitely check before trying it - I've found lots of liquid starches that did not have the correct ingredient. You are looking for something with borax, sodium tetraborate, or boric acid. Hope that helps and let me know if you find anything else!!! In the US, there's a central place for all of this info (the MSDS), but abroad there doesn't seem to be a similar organization. Lots of companies seem to have the option of listing out their ingredients or not - which makes it harder to research! I'm in the UK and I couldn't find the ingredients for the Dylon liquid starch either, so i bought some from Amazon Uk and sorry to say it doesn't seem to work, sob! I haven't found ingredients for this starch but it says it can be used for making 'gunge' http://traditional-starch.co.uk/traditional.html….do you think this kind of dry starch would work as well as liquid starch, is the difference just water? YES! That is the one Sarah tried!!! It will work, but she's trying to put together amounts. If you're up for playing around with it, give it a go. Just dissolve the powder in water first. OOh i look forward to that recipe! in desperation i just made some translucent gelatinous slime goo which is lovely and tactile with agar flakes, water and tapioca starch, stirred up and in the microwave for a minute….slurp! Thank you so much for researching and testing a liquid starch free slime. The boys and I have wanted to try making slime for quite a while now but are unable to find the starch. I can do my best! If you can email me a list of local brand names of laundry detergents at funathomewithkids@gmail.com I can see if I can dig up ingredient lists online and let you know if one will work! Awesome! Thanks for the article! I am curios if you will find an alternative for Belgium, I live in The Netherlands and usually there common brands for BE and NL. I'd be happy to look into it for you - if you can email me a list of local brand names of laundry detergents at funathomewithkids@gmail.com I can see if I can dig up ingredient lists online and let you know if one will work! I've made the borax version here in Australia you can buy borax at bunnings in the cleaning section were they keep the cleaning vinegar and bicarb soda. Oh perfect, Melanie! Thank you so much for letting me know! I know you can't find borax at all in the UK, so it's good to know that it is available in Australia. I'd love some help in NZ! I've tried borax but I got a hard ball - not a bit of slime in sight! We would love to make it for our Playcentre children. I took a quick look earlier and it looks like the laws are different in NZ - brands don't have to disclose their ingredients on the MSDS. The few I looked at said "proprietary ingredients". :( Unless someone lists them somewhere, the only way to figure it out would be to test a bunch of them, which would be really pricey. Did you have any luck finding the right stuff in NZ? I am a Kiwi too and would love to make this for the kids but not sure what to use. I wish I could help! Since there's no way of seeing a list of ingredients online nor is there anyway for me to get my hands on lots of NZ detergent to test in the US (without spending $100s in shipping anyway), I can't make much headway. :( I haven't heard from anyone who's tested any detergents there. If you have any US brands available in your stores, I could tell you more! the substitute worked at school for flubber ... more of a gak mixture, the sodium tetraborate is the real thing on ebay and is about 4.99 for 500g 6.99 for 1kg way more than needed! I've just tried with almat bio and its kinda slimy but not thick like yours in the pic so may have to go back to borax lol! Oh that's interesting! Good to know! Oh I would so love if you could confirm for me that the correct laundry gel is available there! I found the Aldi site for Ireland, but the online version doesn't list the laundry gel (and the UK Aldi's does), so I can't verify that the Ireland stores do have it. If you were willing to check and let me know, I'd be so thankful!!! Thanks so much for taking the time to investigate how we can make it in the UK! I can't wait to get our slime on!! Thank you so much for this post - I hit a brick wall after trying spray starch and Borax substitute with glue and neither working so was so excited to read it still might be possible to do here in the UK! So after buying the Bio, Non Bio and Colour Almat Gel yesterday I can now confirm that ALL of these products produce some really cool slime! I used ordinary PVA glue but found I only needed a very small amount of the gel (for a small tub I only used about 1 tsp so this stuff must be strong!). I have had a look online and think that the same ingredient can be found in Ariel liquid gel, but I've yet to buy it and try so can't confirm it definately works (this is a UK brand that is available in all supermarket stores) - plus I'm no scientist so I could be completely wrong! Anyway thank you again SO MUCH...can't wait to share this with friends!!!! YAAYYYY!!!! Thank you soooooo much for trying those and reporting back! I am having a tough time tracking down the full ingredient lists for some of the brands and it's fantastic to hear that there are more types of Aldi that work!!!!! I will update the post with that super helpful info once I'm back from vacation (on mobile I'm terrified I'd accidentally delete the post or something horrid). Would you be willing to give Ariel a go? You've already helped a ton, so no pressure, but that one is available in a few additional countries, so it would be rad if it worked! Thank you again so much for your help and research!!!! And one last thing - what is your name so I can thank you in the post when I update it? I will try the Ariel detergent and let you know. I live in Germany and I'm struggling to find something that works. Thank you so much for posting an option for South Africa!! I will try it out and let you know how it goes. Thanks again!! Fantastic! Thank you so much, Erin! I'm also from South Africa- couldn't find the ultra ariel liquid detergent so tried the normal one. It just makes the glue runny thiough. I also bought a tub of borax powder which makes the glue clump together if used in its own. After some experimentation with the two, I found that dissolving a small amount of borax in water and adding a small amount of that to the detergent gets some decent slime. Not sure of the measurements that I used but found that youdneed very little borax to avoid lumps. Thanks for the great ideas on your blog. Unfortunately only the Ultra Ariel will work. :( That's great you were able to find borax, though! That's the right thing to do - just dilute it with some water and add it slowly. So glad you found something that would work! I'm in South Africa as well. But having trouble with the glue, is there is a South African equivalent to Elmer's Glue? I'm not sure what it would be called there, but you're looking for a glue that contains PolyVinyl Alcohol. Some countries call it PVA glue. If you use a liquid glue that school children typically use to glue paper, that *should* have the correct ingredient. Hope that helps! Just to say that sadly Ariel didn't work :( ...the consistency changed slightly but the more I added the runnier it then became..what a shame! If I try any others that work though then I will surely let you know! And you are so welcome about using the other types of Almat...I was excited to experiment and it was the least I could do after you provided me with the UK answer to making awesome slime!! From one mum to another..you are fab! Argh! Well thank you so much for trying it!!! Did it happen to be Ultra Ariel Liquid Detergent? That seems to be the only version of Ariel that has the right ingredients. Not sure if it has something else in it that undoes the reaction though. I SO appreciate you being my UK Slime Intel Officer, Heidi! You rock!!!!! Shoooooot. Nope, it's none of those. I wonder if it's something they make for another country. It looks pretty similar, but instead of the world "actilift" it says "ultra". And hahahahahah, I know how you feel with all the laundry detergent! Thank you SO SO much for all of your help!!! we used to have ariel ultra in the uk its now all been rebranded as actilift etc. Well I can say spray starch doesn't work :( I'm in Newmarket Ontario and can't find liquid starch anywhere. I'm going to try to find that seventh generation stuff but I tried using spray starch and ended up with one funky looking mess! Boo. Kids were not impressed with me lol. Ah well, hopefully I can find the right laundry soap. Oh nooooes. Yeah, only certain brands of liquid starch seem to contain the necessary ingredient (borax). Let me know if you can't find 7th Generation Free and Clear - I hear that it's at grocery stores in CA (as well as on Amazon.ca). I just can't tell you enough how much you rock for your research and dedication to assisting so many moms! Really, you could say "here's what to look for, good luck!" so I just think you are a rock star. This site is AMAZING! I can't wait to try this slime. I was wondering if 7th generation baby will work. That is just what I happen to have on hand. Thanks in advance!! Though I haven't tried it myself, I can't see any reason why you wouldn't be able to! Let me know how it goes! Oooh, that is a great question. I don't know of a clear glue in the UK...it would be a glue for children - that's the best I can offer. Not sure how common clear glue is since it is three times the price of white glue here - it might be a bit of a specialty item. If you know of anything in the UK that sounds like that, let me know, but I haven't heard of any... :/ The slime is still really neat, even if it's opaque. THIS IS SO EXCITING!!!!!! I am 99% sure that will work, Lucy! GREAT detective work. We can't wait to hear how it goes. Once I have confirmation it works, I'll add it to the post! Thank you!!!! YESSSS!!!!!!! Thank you, Lucy!!!! Ooh, yeah, I would love to see a photo (funathomewithkids@gmail.com). Adding the info to the post! You rock!!!! HELP! lol I hope you can or one of your lovely followers from the UK. I so wanna make slime for Halloween so I had a practice yesterday doing tiny batches with different glues but none of them seemed to work. I am in the UK so used Almat laundry gel. I couldnt get hold of the clear Pritt glue so I used normal kids white PVA first then tried Craft Planet glitter glue, Sainsburys glitter glue then Glitz pearlescent glue. The Craft Planet glitter glue worked better than the others but it still didnt look like the slime in your pictures. I could feel the mixture thicken as I was stirring then it would soften again if I added any more laundry gel, as though it had too much in it. Does anyone know what I'm doing wrong or is it the type of glue. I have ordered Elmers white school glue to try that. Hoping that will be more successful. Will it work with dry laundry starch if I add water? Did you use the correct type of Almat gel? That would be my guess. It sounds like they aren't reacting correctly, but any type of PVA glue *should* work. So my guess is that you are trying a slightly different type of Almat that doesn't have the correct ingredient. If we can verify that you are using the right type, I'd next refer you to our How to fix Slime post that has photos and see if you can match up what your slime looks like. Let me know what type of Almat and we can work from there! I used the almat biological an it didn't work so I went back to borax! I'm uk as well I also tried three brands of ova and no difference. Nope neither worked for me but my good old borax recipe with a few drops of glycerine to plasticise it worked fab so my son was happy with that?! So strange! So glad that you have access to borax!!! Where did you get the borax Helen pls? Would the substitute work as well? Well I gave up on the first few tests and the best one I put in a plastic bag. When I looked at it the next day it had turned into ok slime. I was really chuffed. Oh nooooo! Yes, please send photos. 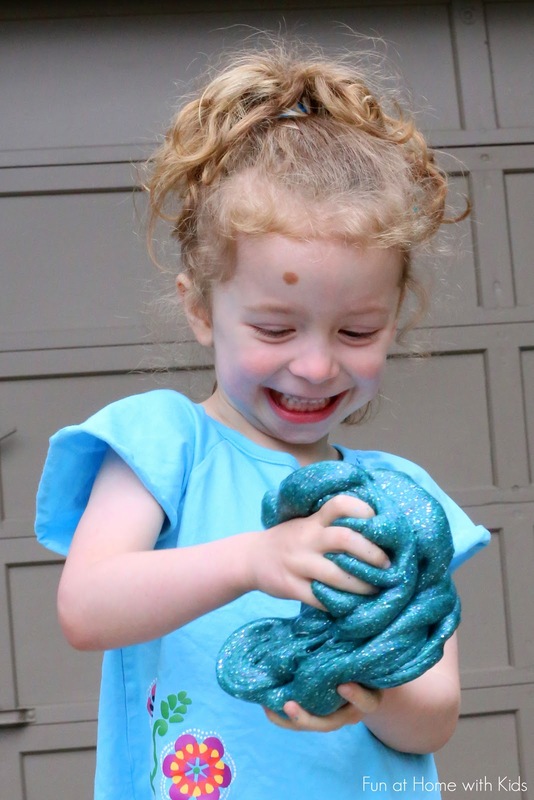 Did you have a chance to check out the post I wrote on Fixing Slime? If yes, did the slime look anything like any of those photos? Hi. Yes I looked at the post on fixing slime but I suppose the nearest it looks like is the one needing more starch. Mine looks more like very soft chewing gum. But sometimes when I added more gel it goes even softer. I had another go today and it was more successful. Mine seems to be very temperamental. I have only been testing tiny amounts so I'm going to have a go at making a bigger batch and see if I find that easier. With the laundry gel though you can't get a transparent slime as the soap makes it opaque even if you use clear glue. I'll also see if I can get the ingredients to try the psyllium husk method. Many thanks for your help, I'll persevere but no doubt I'll be in touch again lol. I love this site! That is so strange! I can't say for sure without seeing it...I'd try adding some more gel and letting it sit for 15 minutes to see what happens. I wish I could get my hands on the ingredients to check it out for you!!! :/ Let me know if there's anything else I can do to help!!! Tried this with Unibond PVA adhesive and Tesco Laundry Gel Non Bio and it worked a treated. Awesome! I can't find a full list of ingredients for that one either. But I'm so glad to hear it worked for you!!!! Used the green Almat bio liquid, as when I looked at this post you said you weren't sure if the non-bio would work, and it simply isn't working :( it's just getting runnier and runnier, not thickening up at all! I don't understand how others have had such luck :( I was very excited when I found this post, now I'm sad, I've been looking for slime recipes for ages, i hope we can resolve my problem! I will definitely have to give it another go! I will try sometime this week as I was hoping to use it at the weekend for a sensory 'Frozen' activity, really hope it works! P.S. your girl is soooooo cute! Could it be that it only works with Almat Gel and not Almat liquid? YES! Totally that could be it, Christina! I didn't catch that there is a liquid Almat and a gel Almat. They very well could have different ingredients and the liquid may be missing the boric acid! Awesome catch!!!! This recipe worked first time for me with the non bio version. My 4 year old loved playing with it. Thanks for all the tips. I just made this using Tesco non bio liquid gel, first time I made it so can't compare to any other brands, however it went down a treat. I feel I should leave a quick note of thanks for finding a clear glue in the UK. Although I'm not making slime I needed clear craft glue for a nail art project and was getting into all sorts of mess that I couldn't find one (apart from importing an excessively priced one from the US on Amazon). Hi - I have tried this mixture (regular PVA glue and the Almat Bio liquid gel) twice now and not even got close to the consistency shown in the videos/pictures - it's staying very thin and not thickening up at all. Is there anything I might be doing wrong? Hoping to use this with my year 4 class as I am a teacher but if I can't do it, they won't be able to either! Gah! I wish I knew what it was that was going funky for some of you! If you still have some supplies, would you be willing to shake your Almat well and then try again? I can't get the supplies because Aldi's doesn't ship to the US, but if I were there, I think I would try shaking the Almat well, then putting several ounces of glue in a bowl and adding the Almat just a small dollop at a time and stirring well for an extended period of time (maybe 1-2 minutes each time) watching carefully for any clumping (that would be the slime forming). With US ingredients, it gets all stringy when you add too much detergent, but I think that the UK ingredients might look the same at either end (both when there's too little and when there's too much). So my best guess is that it might be a delicate balance and you might have to be very slow and careful to catch that correct ratio? Let me know if you're able to try again and the above works!!! So sorry I can't give more insight - I just have no firsthand experience with the Almat gel! Persil non bio liquid seems to work. But it's quite slimey (no mention of Borax in the ingredients but it works). Helen Waddington's ebay purchase borax powder was the best for me - diluted in water then just added - small amounts at a time to PVA glue. Didn't seem as harsh on my hands and as smelly as the Persil. Thanks for all the tips and for posting this Asia. I'm trying it out with some kids tomorrow in a workshop - but we're keeping it small scale - hand size blobs! I'm not a chemist but just wondered if it is safe for kids to have something in their hands that contains laundry detergent or boric acid ? Does this react with the glue to make it inert so safe to play ( obviously wouldn't eat it but to touch). I have a little girl who loves gloop and love to play with thisbut hesitant as the ingredients in it is things you put out of reach so they can't play with it. Also she has eczema so will this be ok to use ?thanks in advance. Yep - all the ingredients are non-toxic. I don't ever recommend using it with a child who might eat it because, despite being non-toxic, a tummy full of glue and detergent is not a good idea. I don't know how her eczema will react - that's a tough one. 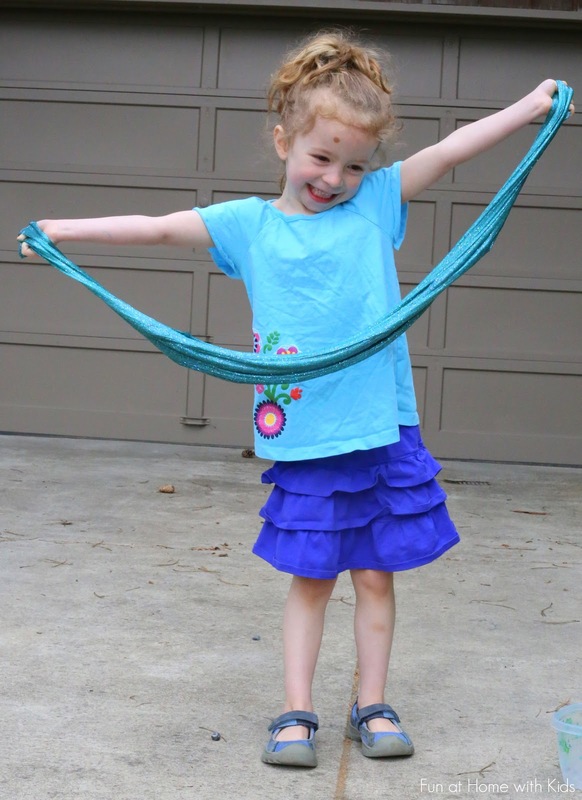 The 7th Generation is free of dyes and scents, so I'd guess that's your best bet, but as with anything, it could upset her eczema - I just couldn't tell you. Sorry! Thought i already sent this but its not showing up. I am looking to mak. Crystals on pipe cleaners and was wondering if you know of a non toxic alternitave to borax that is avsilable in the uk? Very excited to find this mixture. I teach a lot of different groups, and allergies are always a factor. My skin also does not react well to a lot of things, so I'm excited to find a free&clear recipe. We're going to test out a few different detergents tonight to see which works the best. The kids are very excitied! If it works well, I'll bring it into the classroom later. Thank you! Hi there. Love your posts! Just to let you know I failed miserably 5x yesterday. Using cheap pva glue. But today I used almat bio and pva glue from school. And it worked!! The trick is to add a teeny bit of almat at a time. Rachel. Uk. Yes!! I couldn't work out how to put the photo here! (You are welcome to, if you can) it's so cool. Fast flowing ooze! Thanks asia. Rachel. This is great, thank you so much! We're in the UK and I was worried when I started researching this and saw I needed Borax! I used Almat fragranced laundry gel, PVA glue from Wilkinsons and then added magnetite to make it magnetic - awesome! That is SOOOOO COOOL Karen! I love it! I found PVA and Almat Bio Gel didn't work. It just wouldn't thicken, no matter how I skewed the proportions. However, because I am stubborn I kept faffing with it to see if I could rescue the ingredients I'd already wasted. I'll recount what I found, in case anyone else wants to try! I kneaded small amounts on a silicone mat - small improvement with much work. So I beat it in the food-mixer to save my hands and time - lovely froth, but sticky and thin. I accidentally kneaded a small amount in my hand, trying to get the sticky bits off - it turned into very thick slime, like silly putty. Progress! I kneaded a larger amount on a board - no improvement. I decided the only difference between my palms and the board was natural oils, so I started adding olive oil. Big help. Leaving a thin smear of sticky goo to dry on a silicone mat helped too - I suspect there was too much water in the mix - maybe from glue. I added cornflour to counteract the water - that helped too. Thank you! I was panicking that I couldn't find Borax to use in my school for Science week. Your blog saved me-Almat from Aldi both non-bio and bio worked well. Lots of happy children with bouncy putty balls! So glad to hear it! Hooray!!!! can you put amsterdam too? YESSS!!!!!!!!! So excited! Is it OK if I add that to the post with your name as credit? Hi, can you use home made liquid starch made with cornflour and water? I am planning to make Troll Slime for a Harry Potter party! I live in the UK and have found the Elmer's glue (glitter and clear) on ebay with free delivery. Nope, unfortunately that won't work. You'd either need to use the Almat gel or the Seventh Generation Free and Clear detergent. Sorry! Oooh, great advice! And happy slime making! Hi, yes you can get almat bio laundry detergent/gel, but i am habimg problems with my slime. When i mix the glue and the almat the mixture thickens a bitmbut after that is dosent change at all. It might be the glues fault as im using craft glue (dont know if its pva or not). Please answer, Thanks! Oh it may be the glue! Most washable school glues are PVA based, but I'm not sure about craft glues. I hope that helps. Shoot. Maybe try adding slightly more glue? Fantastic, this is such useful information. I will know some very happy kids. Thanks for all the chemistry help! Almat non bio worked extremely well for me. Very strongly scented though! Oh bummer! I love that the US detergent is unscented - too bad I can't find an unscented UK detergent! Hello, I'm from Colombia and i'm pre school teacher. i tried to do that so many times, with so many productos but none worked :c it's so sad, because i used so many things and i had to discard it everything, and i really want to do this slime to do an activity with my kids. Hi! I'm from the UK and just made my own slime for the first time following these guidelines and it turned out great - just like on the pictures!! What I used was the Almat laundry gel (non-bio) from Aldi and Wilko's "Let's Create" PVA glue. It's important to slowly add the detergent, small bits at a time until you get the texture you're after. Really struggling with Aldi almat bio gel and blutack pva glue. Tried adding drop at a time but still really sticky and no clumps at all. I tried Elmers school glue and the Seventh Generation from the US link above for Amazon, but it's not congealing. Any ideas? Ack!!! Hmm, maybe give the 7th Gen a few good shakes first? I'd also try adding about a tablespoon of glue to a container and then adding several teaspoons of 7th gen. If that doesn't congeal - send me a photo at funathomewithkids@gmail.com and I'll see if I can figure out what's up. Hope that helps and sorry it wasn't working for you the first time! Glad I posted. Seems other had the same issues. I've ordered the Tide as well and will see if that makes a difference. No matter how I worked out the proportions, it just wouldn't be anything but white liquid goop. Maybe one of the companies changed their formula somehow? Oh no! That makes me worried that they changed their formula and just haven't updated online... I'll try to get ahold of a new container this week and try it to make sure it works. All you do is pour a little glue and add the laundry detergent a bit at a time and stir until the slime forms. If you're willing, can you email me what about a teaspoon of glue with about a tablespoon of laundry detergent stirred into it looks like for you? It would really help me get to the bottom of this. My email is funathomewithkids@gmail.com. Thank you!!!! I just checked the MSDS (ingredients) available online and it was updated in May and the ingredients are the same as when I wrote this... Another possibility could be that a batch went through without the boric acid added to it? Not sure. I'll still try and check with a trip to the store. Sorry for the delay. Crazy busy week. I can't promise anything, but I'll try putting a teaspoon of each together this weekend to see what happens and will email you about it. I actually ended up hearing from several others (in different locations in the US/Canada) and I think that 7th Gen must have switched the formula and just hasn't updated their website. :( SO sorry I didn't know sooner! The good news is that you aren't doing anything wrong and that Tide Free and Gentle works. Again sorry for the trouble with the slime - I had no idea they'd switched the ingredients -- but I appreciate you and the others letting me know so we realized that that was probably what's been happening to everyone! 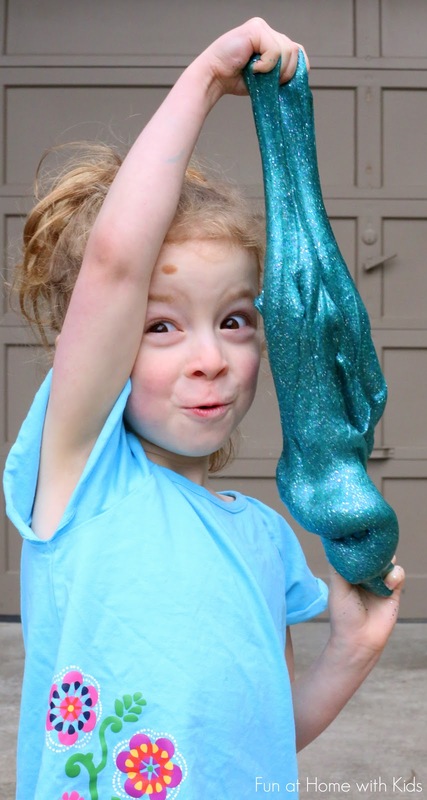 Hello I'm from the uk and I've tried to make the slime using the persil detergent that supposedly works but I'm having trouble getting it to work, it is very runny and I can't get it to solidify, is there anything I can add to it to help? Merci par avance de votre aide, ma fille rêve de faire cette glue fantastique depuis qu'elle l'a découvert sur YouTube !! Salut Virginie, je vous remercie pour l'écriture. Non, je ne pense pas que l'amidon va fonctionner. La raison de notre amidon fonctionne est qu'il a le borax en elle. Si l'amidon de riz n'a pas borax en elle, la boue ne fonctionnera pas. Pouvez-vous me faire parvenir une liste de détergents à lessive en France ou pouvez-vous trouver de la poudre de borax il? A priori la vente de Borax est très réglementée en France, seuls les professionnels peuvent en acheter..
Voici la liste des lessives vendus en france : Ariel, Dash, Omo, Skip, LeChat, Xtra, Persil, Mir, Super Croix. Malheureusement, je ne peux pas trouver les listes d'ingrédients pour la plupart des détergents dans la liste. En Amérique marques ont à la liste de leurs ingrédients en ligne, car il est la loi. Mais dans certains autres pays, vous ne disposez pas d'énumérer les ingrédients. Il semble que vous ne disposez pas de les énumérer en France. :( Il est possible que l'un des détergents a l'ingrédient correct (acide borique), mais je ne sais pas pour sûr sans voir la liste des ingrédients. Je voudrais pouvoir aider plus! I'm from Singapore! And I have found out that Easy On starch spray works, however, if you're expecting a more flubbery slime, then this might not be your cup of tea. Any starch spray should work, I've seen some on Youtube using another brand. Another method that worked for me was to use the Renu contact lens solution. But do note only those that contains borax works. So do rmb do look at the list of ingredients for the product. Hi, I've used Almat non-bio and it worked eventually! Wasn't right at first but with a little time and kneading it started to improve. I was then adding one drop of gel at a time and massaging it into the surface of the lump I'd kneaded! I could then add more glue and get the right consistency. I also found it he helped the stretchiness of it to add a bit of water. This also made it feel really slimy so giving the kids some water for them to dunk it in and play with too. However, I have one concern. Is Almat toxic? I know originally you looked for non toxic ones but I don't think Almat fits this criteria. Anyone know of a non toxic one? I'm glad to hear it eventually worked! And I'm not sure about the non-toxic. In the US, all brands are required to put out an MSDS which lists whether or not the material in question is toxic. Here in the US, our detergents are non-toxic (though I'm sure if I dug enough I could find an exception), so my assumption here is that it's the same in the UK, but it's possible that it's not. Is there any sort of mark on toxic materials in the UK? Or any database that would have that information? I'm not sure how things work there well enough to even know where to look for that kind of info. Im in Uk and just used Tesco kids white pva glue and tesco bio gel lqundry detergent and that worked well.